It was on August 3 that I first read about the so-called Borbély castle in Tiszaroff. It was refurbished after the change of regime and was owned by a German businessman who made a four-star luxury hotel out of it. In the wake of the recent downturn in the economy, however, the business failed, and the owners put the property up for sale. The article I read in Vasárnapi Hírek reported on rumors circulating in the village that the Hungarian National Bank had purchased the castle for use as a vacation resort for the central bank’s employees. And indeed, a week later it became official. The bank purchased the property for €1.3 million (415 millon HUF). Kester Eddy, a reporter for the Financial Times, had a great time writing a story about the purchase. It reminded him of the days when, under communism, state companies and institutions owned holiday properties so their employees could spend two weeks splashing around in Lake Balaton. The bank struck back and explained that “the Magyar Nemzeti Bank, like other EU central banks, seeks to provide its more than one thousand employees with fringe benefits.” Moreover, the castle-hotel is located in the country’s least developed region and by opening the hotel again “more than 30 new jobs have been created.” Between May and the end of August it will function as a recreational center and between September and April as a training center. 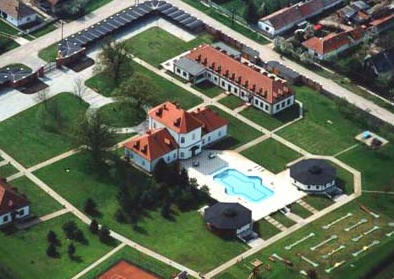 Earlier the Hungarian National Bank had seven different vacation homes, but by 2009 the bank sold them off one by one. In these still difficult economic times it is hard to justify buying a luxury hotel even if the price was apparently attractive. The owners asked 680 million forints for it, but the bank managed to purchase it for a mere 415 million. Moreover, Matolcsy pointed out that the bank had earned a profit of 26.3 billion forints and therefore the purchase did not cost taxpayers a penny. An interesting explanation from a central banker. The brouhaha over the purchase of the castle-hotel had barely died down when HVG learned that the Hungarian National Bank also bought perhaps the most expensive office building in Budapest, the eight-story Eiffel Palace. Originally it was rumored that some of the offices of the central bank would be moving into the building. Portfolio thought that purchasing a class A office building was an acceptable business concept. Others were less sanguine. For example, the popular blogger orulunkvincent.hu. According to him, the price was €57.5 million (18 billion forints) and the building has 14,000 square meters of rentable space. In calculating the potential return on this investment he assumed the top rental rate for space in a green building, €13.5 per square meter. In downtown Pest 86% of the available office spaces are occupied. If the Eiffel Palace has the same occupancy rate its gross annual rental income would be €1,950,480. Assuming an 80% profit and 10% tax, the net rental income would be €1,404,346 per year. That means a return of 2.44%. Five-year government bonds have an interest rate of 4.70%. So, says the blogger, this deal does not sound so fantastic to him. According to critics of the deal, the Hungarian National Bank grossly overpaid the owners of the Eiffel Palace. They paid almost 18 billion forints when according to real estate assessors it is not worth more than 11-12 billion. E-PM will go to court in connection with the purchase of the office building because it suspects malfeasance or a breach of fiduciary responsibility on the part of the central bank. But these two purchases were nothing compared to yesterday’s revelation. HVG learned that the central bank had transferred 200 billion Hungarian forints to its five foundations named after Pallas Athena, the goddess of wisdom, courage, inspiration, civilization, law and justice, just warfare, mathematics, strength, strategy, the arts, crafts, and skill. A perfect description of Hungary today! This amount is one and a half times more than the Hungarian government spends a year on higher education. Initially it was known only that this money will be spent on education. Today the central bank released details of its project. “We are creating a faculty of economics and finance at Kecskemét College, a faculty of finance in Marosvásárhely/Târgu Mureș (Romania), a doctoral school in the Buda Castle, and an intermediate financial training center in Pest.” The reason? “The already obsolete doctrines and mistakes of the neo-liberal school of economics continue to dominate Hungarian education in economics and finance.” Since Matolcsy thinks that mainstream economists in the country–and that means practically all respected experts–are wrong and since he cannot get rid of them, he will build parallel economics departments that will teach his unorthodox economic theories. Just as the Orbán government needs an alternative Holocaust Museum and an alternative academy of artists it also needs a new set of economists who will be the high priests of unorthodoxy. Matolcsy admitted that it will be an expensive undertaking because, after all, they need “new institutions, professors of new vision, and new teaching materials.” Creating new institutions will probably be the least of Matolcsy’s problems. Where will he find those professors of new vision? Where is he going to find new teaching materials? Perhaps he is planning to write them himself because I can’t believe that any self-respecting economist would be willing to write textbooks acceptable to Matolcsy. I tried to find out more about the institutions mentioned and, as far as I can see, only two seem to exist. The Kecskeméti Főiskola at the moment does not teach economics. It has one section that produces elementary school teachers, another where they teach information science, and another that specializes in what Hungarians call “kertészmérnöki kar”–less elegantly put, gardening and landscaping. This college was established in 2000, i.e. during the first Orbán administration. The second institution, in Marosvásárhely/Târgu Mureș, is not mentioned by name, but I guess it is the Sapentia Hungarian University which was established in 2001 and heavily subsidized by the Hungarian government. I remember that shortly after the 2010 election Viktor Orbán made a trip to Târgu Mureș and gave a billion forints to the institution. As for the others, I assume they will be established sometime in the future. I used to think that I could not be surprised by anything that is done by this administration, yet I am surprised time and again. It is really frightening how much power is in the hands of people whose sense of reality is greatly impaired.